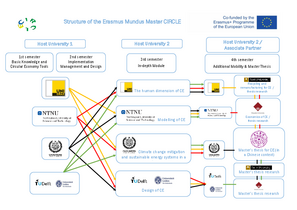 The objective of the “International Master's Programme on Circular Economy (CIRCLE)” is to offer an international and interdisciplinary Master's programme at the highest level, which allows the participants to make an essential contribution to understanding and proposing solutions to problems in order to support the transition towards a sustainable society. Participants in the programme will receive a specialized academic training in the field of circular economy. Through the composition of the consortium a unique view on the field of circular economy on a global, European and local level is possible. In this way, the students learn a methodologically correct approach to complex interdisciplinary issues and are introduced to specific subject areas by experts of the partner universities. Thereby, a strong emphasis is placed both on research and practical problem solving applications for sustainable Development. The Master’s Programme comprises 120 ECTS credits, which normally corresponds to a period of study of at least four semesters or two years. Students spend their first year at one of the European partner universities = host university 1. The first year comprises 60 ECTS credits. For the second year, students choose another European partner university as their host university 2. The second year also comprises 60 ECTS credits. carry out exclusively research activities for their master's thesis.